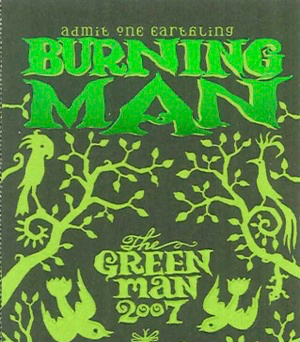 Burning Man announced the 2007 theme early: The Green Man. I’m choosing an ecological interpretation. The purpose of a government is to improve a society, and life in that society. Society under government should be better than society would have been without it. One example of effective government is a properly regulated natural monopoly. For example, it’s more efficient to run one set of natural-gas pipes through a town’s streets than it is to have the streets dug up by, say, three different gas companies in order to avoid the high prices of a market that lacks competition. So governments choose to allow a monopoly, but the monopoly isn’t allowed to price on the demand curve, as a monopoly ordinarily would. Ideally, from the customer’s and investor’s point of view, the regulated monopoly looks like a company in a competitive market. Another example, closer to the theme, is ecological regulation. Businesses, left to their own, tend to pollute. Why is that? Because there is an economic incentive to do so. Scrubbers cost money! Ordinary market forces do not influence polluters because polluters benefit from polluting, but they do not see the costs. These pollution costs, which are external to the market, are the problem. Such market “externalities” need to be corrected before market forces will balance for the best of society. Governments regulate pollution makers for that reason: to compensate for the externalities. Do what is best for society, or you will not be allowed to sell into our market. But who decides what the government does? I want this installation to remind people that they have choices. It isn’t valid to say, “It’s okay to do anything that the law allows,” because the law comes from us. You know that it costs more to get a package sent to you overnight. You want it quickly? That package is gonna fly in a plane that is burning aviation-grade kerosene. But do you consider that flying your package to you changes climate much more than driving it to you? So, although you like to have your mail-order products ASAP, instead of paying the extra $5 or $10 for quicker gratification, choose shipping that will release the least amount of carbon into the Earth’s atmosphere. And that’s the point. You have a choice now, because you’ve learned about the consequences of your actions. This installation will reveal several of the choices that we, the people, can make every day. We must understand that there are choices and that there are consequences of those choices. Then we can make our choices, informed, for the best future.